Portable Automatic Pill Dispenser (e-pill PD2) fits in pocket or purse. Each day can be programmed for 1–4 daily medication doses. Holds 14 dosage events per tray (2 medication trays included). Clinically tested. Locked version used in Drug Rehabilitation. Quality item Made in Finland (Lokekello). Designed for Institutional or Home use. Precise Medication Window (180 minutes). Example: the e-pill Med-O-Wheel SMART is set to give the medication at 9 AM. The medication can be taken from the e-pill dispenser between 8 AM and 11 AM. Up to four (4) daily medication events can be scheduled. When the user presses the transparent part of the device cover, Med-O-Wheel moves the correct dose for release. Portable Automatic Pill Dispenser can be used inside or outside the patient's home (work, school, out-patient clinic, rehab). 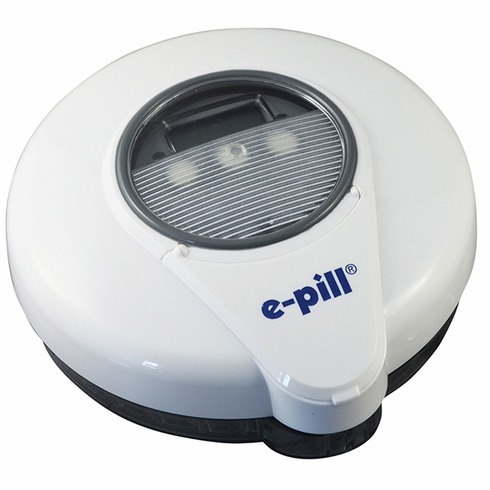 References: This device (e-pill Med-O-Wheel SMART) is in regular use in the UK, Finland and Sweden. Published Clinical Study (Opioid Substitution Treatment / OST Opioid Replacement Therapy / ORT ). Alarms: 1 - 4 Medication events per day (4 doses per day). Daily medication events are always scheduled at the same time each day (PRN dosing not possible with this e-pill dispenser). Pill Capacity: 14 Dosage Events. Up to 18 aspirin sized tablets per dosage event.